As someone who has visited the emergency room with a threatened miscarriage, I know all too well that the emergency room is not the place for miscarriage, threatened or not. In my experience both as a doula and a patient, emergency room staff are not well trained in miscarriage. It would be extremely beneficial to women and their grief experience if the nurses, doctors, and technicians had a better understanding of the needs of women experiencing miscarriage. 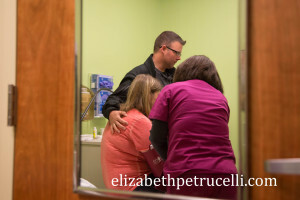 We cannot discount how difficult the experience of miscarriage can be for the medical staff. Untrained personnel can feel guilty and ashamed at their treatment of the miscarrying patient or they may believe they are being helpful when the patient feels it is hurtful. For these reasons and more, medical staff should have the support of their department managers by providing them with training on the unique needs of miscarriage which takes place in the emergency room. Contact Elizabeth Petrucelli to bring her to your emergency room for an in-service or training on How to Help Women Through Miscarriage in the Emergency Room. Check out this article published in The Mighty about a woman’s needs.